A sobering day at the Killing Fields of the Khmer Rouge | more mojitos please! In the short time I’d spent in Cambodia, I’d been absolutely blown away by the gentle, warm and kind nature of almost every Cambodia we had met. They were all so generous and thoughtful and it was rare to walk a few minutes without being greeted by a local’s smiling face and friendly wave. So many of these kind, smiling people had almost nothing to their name – and yet they seemed so open and joyful in their day to day lives. 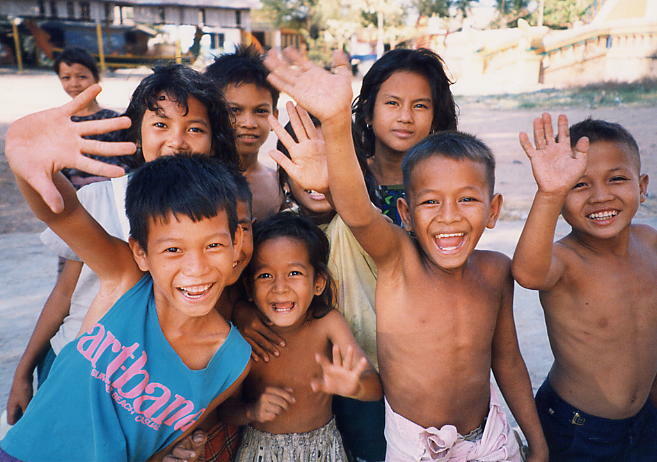 The perpetual joyfulness of the Cambodian people is made even more extraordinary when you learn a little more about the atrocities that they have suffered in the past. Gaining a greater knowledge and understanding of these devastating war crimes was the focus of our few days spent in the capital city, Phnom Phen. 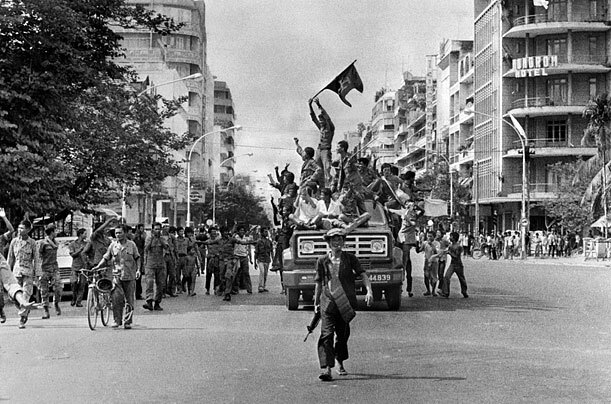 The darkest years in Cambodia’s history were those of 1975 – 1979, when a radical Communist regime lead by a man called Pol Pot and known as the ‘Khmer Rouge’ seized control of the country. Almost immediately after forcing their way into power, they set about on devastating and merciless mission to completely destroy Cambodian society in order to rebuild a revolutionary ‘pure’ society from scratch. 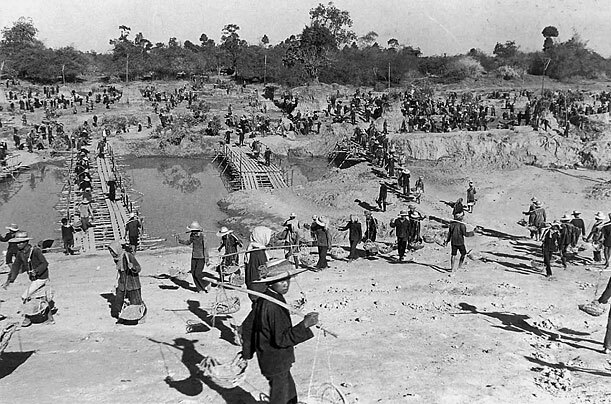 City dwellers were forcefully relocated to isolated farming areas and put to backbreaking work as part of the Khmer Rouge’s vision of an agrarian society. Women, children, the elderly and the ill were not exempt from the work. Thousands of people died during the long, brutal march to the farming sites and even more died of exhaustion and illness during the years of famine and brutal slave labour that followed. 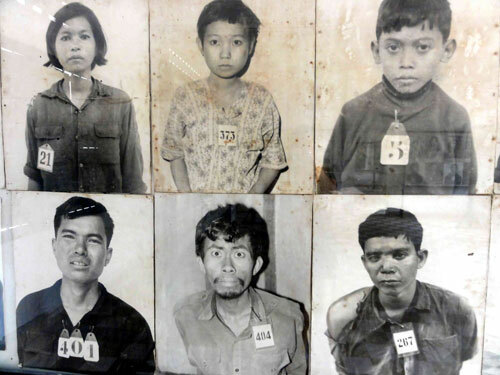 The educated, cultured, foreigners and anyone who was suspected of having anti Khmer Rouge ideals were subject to merciless cruelty at the hands of their soldiers. Merely wearing glasses was considered a sign of intellect and could result in being arrested. It is estimated that by the time Vietnamese forces entered the country in 1979 close to two million people had died from a combination of executions and forced famine and disease at the hands of the Khmer Rouge regime. 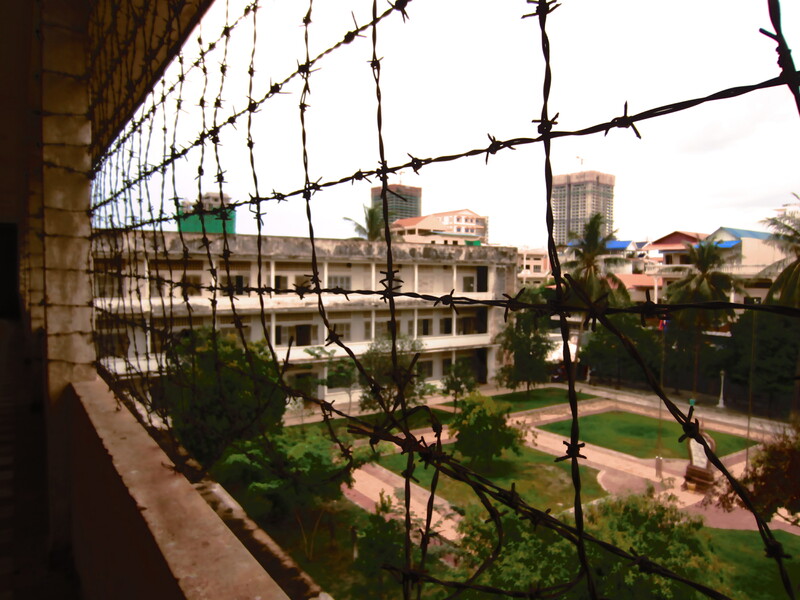 One of the most infamous sites of the Khmer Rouge’s atrocities is the S-21 Prison in Phnom Phen. 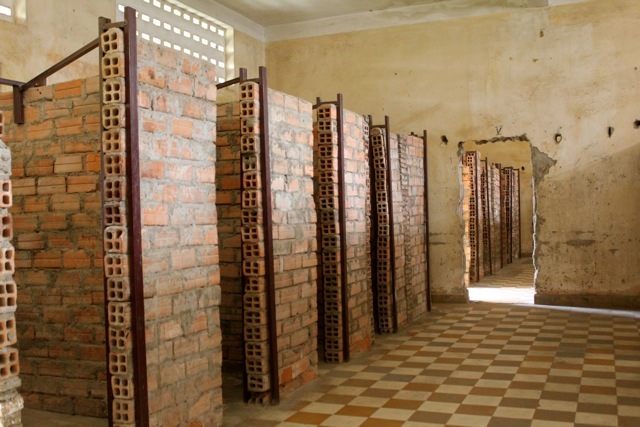 The prison was located in a former primary school and was used as a site to hold and torture those who the Khmer Rouge had deemed a threat to their regime. 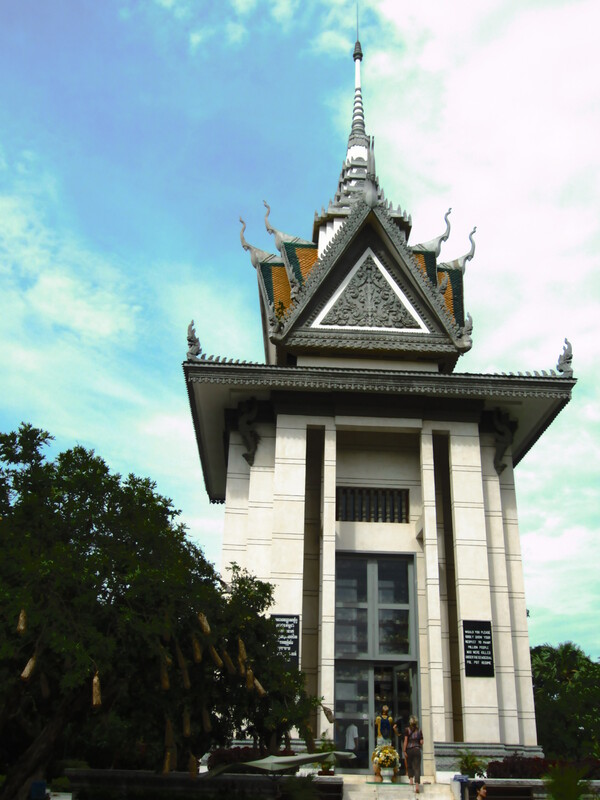 The prison building has now been transformed into the Toul Sleng museum with an aim to educate locals and visitors of the atrocities of the prison as well as remembering those who suffered there in the years of the Khmer Rouge rule. We visited the Toul Sleng museum in the sweltering afternoon heat of our first day in Phnom Phen and it was an incredibly sobering and shocking experience. Wandering from room to room, we were able to see some of the restraining devices and tools that had been used for the torturing of prisoners. Cruelly, prisoners were restrained and tortured for days at a time until they relented and agreed to sign fabricated confessions relaying their alleged betrayals to Pol Pots regime. Similar to the Nazis, the Khmer Regime meticulously and systematically recorded all of those who passed through the gates of S-21 prison to be subjected to the horrors inside. Every new prisoner admitted was photographed and recorded and many photographs were taken of those who died due to torture or sickness within the prison walls. The frightened, haunted faces of the former prisoners stared out at me from the hundreds of photos that lined the inner walls of many of the chambers. Whilst viewing the shackles, knifes, clubs and other instruments of torture that were used during the interrogation of prisoners I couldn’t even begin to fathom the horrors they must have been subjected to. On our second day we hired a tuk tuk to drive us the 15km out to killing fields site, and after half an hour of rattling along and a few hair-raising near misses with trucks we pulled up out the front of the Choeung Ek Genocidal centre. Included in the $5 entry fee was a free audio guide which led me step by step through the museum grounds, explaining what occurred at each site and narrating stories of survivors of the brutal regime and their experiences. I found this guide extremely valuable in developing an idea of what occurred in the place as very little remains that you can identify visually. Grass covered mounds and hollows in the ground looked benign and peaceful until I realised that these were previously the sites of the mass graves into which bodies were thrown after execution. Were it not for a number of signs I likely wouldn’t have spotted the bone fragments, human teeth and scraps of clothing that are constantly surfacing and littered the dirt pathways around the site. Voices over the audio guide told of the trucks of prisoners that usually arrived at the site in the dead of night. Prisoners were loaded off, had their names meticulously checked off a list before being lined up in rows, tied at the hands and feet and blindfolded. Without warning or mercy the prisoners were then killed on mass before their bodies were flung into the huge open pits in the area that were used as mass graves. The methods of execution varied but it is believed that in order to save on ammunition, many of executions were carried out using farming tools, poison, spades or sharpened bamboo sticks. 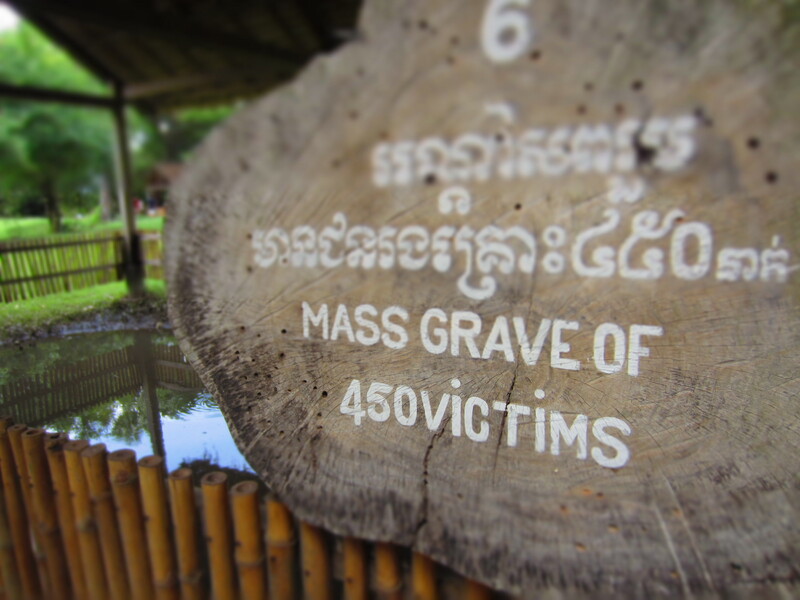 Signs everywhere pinpointed the sites of multiple mass graves – one had held the bodies of over 400 people and in another over 100 headless corpses had been found. 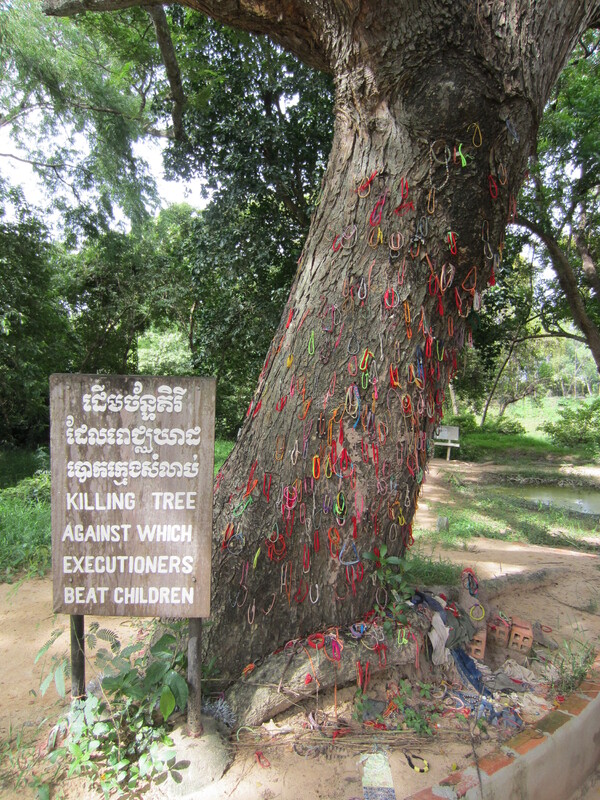 One of the most distressing sites is known as the ‘killing tree’. It was against this tree that the Khmer Rouge guards would beat to death small children and babies. 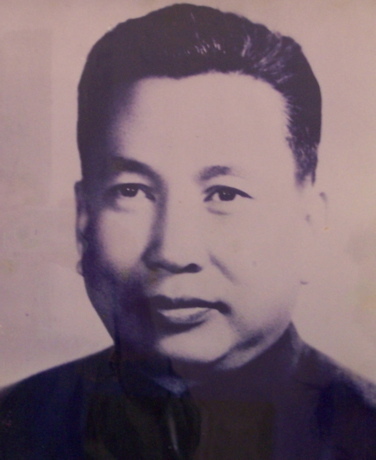 Pol Pot apparently once said ‘to kill the grass you must also remove the root’. He believed that the entire families of supposed ‘traitors’ should be wiped out to prevent any other members of the family seeking revenge in later years. He also apparently said “It is better to kill an innocent by accident than let a traitor go by accident”. I couldn’t even begin to comprehend the twisted mind of someone who thinks like that. The final stop at the site was a 37 metre tall Buddhist shrine known as a stupa that was erected as a memorial to all victims of the Khmer Rouge and to give some of the remains found at this site a place to rest. 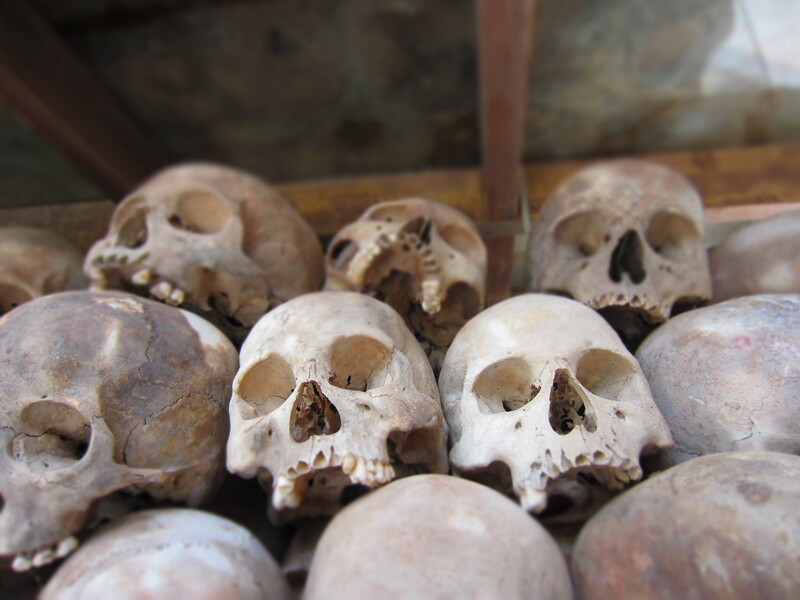 Over 5,000 skulls alone are housed inside in the stupa. 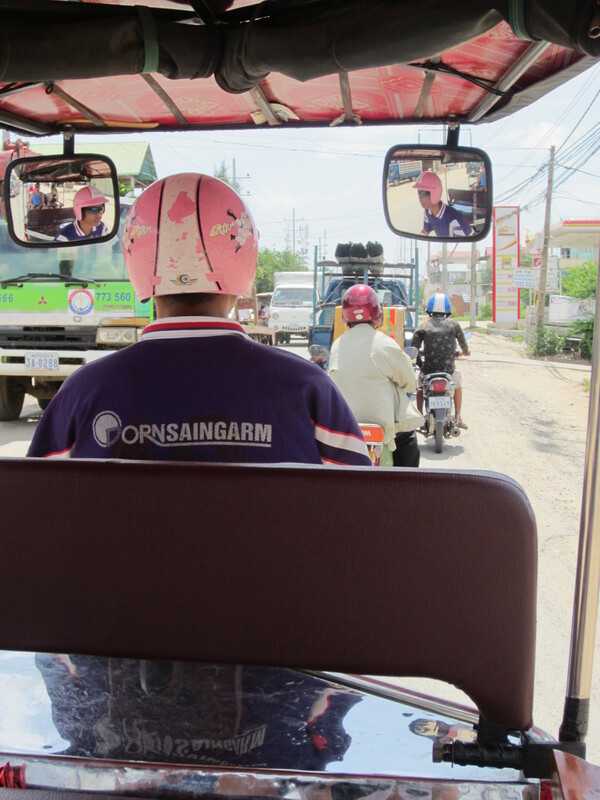 Eventually it was time to leave and we both quietly and somberly made our way out to our waiting tuk tuk driver outside. It’s difficult to describe how you feel after visiting a genocidal site such as this – seeing and hearing of of such atrocities happening in such recent years brings on an overwhelming horror at what we as human beings can be capable of . The experience was shocking, stressful and incredibly confronting but one that I believe is essential for gaining a true understanding of Cambodia, it’s people and what so many of them have lived through – after all virtually any locals over 40 are survivors of those years. 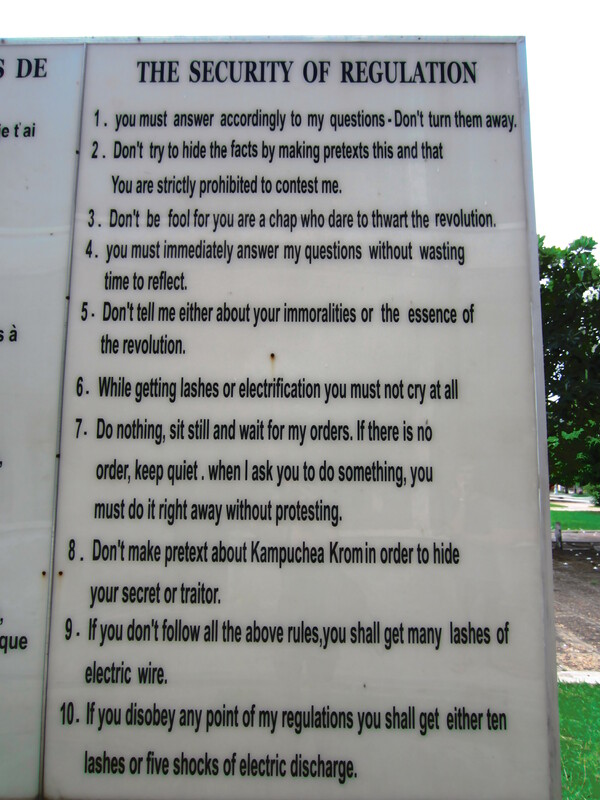 The heinous atrocities of the Khmer Rouge regime must not be forgotten and I can only hope that through education and sites such as the Genocidal centre that the phrase ‘never again’ will ring true in years to come. The atrocities in Cambodia are difficult to comprehend. Thank you for sharing your experience in such a comprehensive and sensitive way. I would really like to reblog this for my readers, I would put a link to your blog if you’ll give me permission?